Victory, defeat? Well, yeah, I suppose, but push come to shove, when it's remembering time, it's the stinky feet that gets you every time. And the claret, of course. This is about claret. You already know about stinky feet. Claret. They make it in France. Over here in the rest of the world we call it Cabernet Sauvignon and most people, 99% and more, have never had a great one that's been aged in a cellar to the exact absolutely right point when it's perfect and smells like God in His heaven and stinky old railroad ties. I expected, you know, the God in His heaven bit, but I was surprised when I got to the part about the stinky old railroad ties. It took a long time to learn about Cabernet Sauvignon. There are two ways to learn about it: the first one at your daddy's knee sipping on old Chateau Latour that's been lying in the family cellars for the last twenty years along side the bonds and waterproof stock certificates, and, the second, as a much too intense wine geek who spends his every nickel on expensive bottles that must then be cellared for years before they can be drunk so you're forced to spend the money on the old ones at Ernie's in St. Helena if you want to drink them now. Some attend the University of California at Davis, of course, and become enologists, but that's much too middle class. Learning it at your daddy's knee allows a long learning period on daddy's nickel and still provides you with the wherewithal and access to others who can also afford them too, learning the niceties along with the nose, while geeks, of course, geek it and although they more thoroughly learn it, they take it way too far off the chart for polite company and don't have nearly as much fun in the process. I, naturally, not having a family steeped in stock certificates, geeked it, what else? I was surprised at that first hint of creosote that reminded me of the railroad tracks down by the beach where I once lived as a kid north of Seattle. That thin whiff of tar, coupled with some other things they talk about in Cabernet, (cedar) cigar box, mushrooms (what do freshly cut mushrooms smell like, not much, I can tell you. ), black current (when young), and a long list of other, colorful aromas, some of which you can actually distinguish in the wine(s). I don't spend the money on great wines or even good wines anymore. It was a passion of the 80's and it was interesting geeking, really geeking something nobody really knew much about, even the people who made it. It took me three years of pretty much constant wine tasting in the company of people who knew the difference to develop a model that could differentiate between the good and bad, the old and young wines we so rigorously smelled and tasted, to learn to identify what characteristics implied the potential for longevity and ageing and I think I've lost most of that now through disuse. I certainly don't follow the current vintages. I think I still know the smell of a great Cabernet Sauvignon, I think I can tell you tasting blind when one wine is good and one wine is great, but I'm just as sure I can be fooled now as I was often fooled, but less often fooled, back then. It is my one experience of really "smelling" something, of using the sense of smell and remembering smells and odors, the good, the bad and the not quite ready. Today I have the occasional (cold American) beer. I have come full circle and you are allowed to snigger. On the other hand, I can reliably nail stinky feet when I smell them, in the evenings, after dinner and a couple of beers. 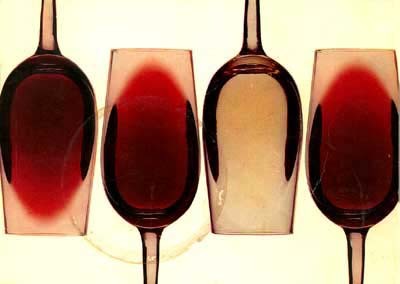 The photograph is from the cover of Michael Broadbent's Wine tasting, enjoying, understanding published by Christie's Wine Publications. A good book on wine from an earlier (1977) era.